Aha! has the tool to help both product and marketing teams. "Amazing product for ideation with integrations into other amazing products." We use Aha! for ideation and generation of features from our internal and external contributors. We like the ability to give our contributors a portal for easy access to submit, comment, vote and follow up on ideas. The contributor might not always know the best fit for an idea, we like the ability to move ideas between product lines with the click of the mouse. We started using the road map feature to better inform our upper level management of our progress. We are really excited about the integration with Azure DevOps. As a development team, we rely heavily on DevOps and the integration allows use to reduce the data entry aspect. The development team can comment in their system and the contributor can answer in Aha!, this creates a seamless flow. Overall, for the past year, we have been learning the platform and building out our processes. We are at a point now where we have embarrassed Aha! and will be promoting this throughout our organization. One of the biggest hurdles is understanding all of the options you have at your fingertips. The learning curve was a little difficult at first to make sure you were using the correct area of the platform. For example, there are multiple road map options. Finding which one fits best for your need was something we had to learn by trial and error. We were attempting to solve the ideation portion of our software development life cycle. We had tools for developers and testers but nothing for the product owner and contributors. We knew we needed a way to track the ideas of our contributors in an orderly fashion as to not overwhelm the product owner. With Aha!, we are able to keep all the ideas in a central location and allow the product owner to manage and provide feedback. Sign in to G2 to see what your connections have to say about Aha! "a focussed and feature rich product management tool"
Aha! provides a complete set of tools to manage the full cycle of Product Management and Marketing. I started using product development tools like Jira, and then VersionOne but each felt and operated as if they were developed for on purpose and evolved into product management tools. None handled product marketing. From the moment a fellow CTO introduced me to Aha!, it became very clear that this tool was designed from scratch to handle the full spectrum of product management. The governance features that help the product owners focus on the business strategy and goals, help define product initiatives to deliver on those goals. Customer Personas help the product team remain focused on the customer. Our product owners love working with feature development since they define both how the features should work, and they also get to prioritize feature delivery. The customizable Aha! Score helps align value with cost to develop. For development, we integrate to Azure DevOps so the developers can focus on their development tasks while maintaining visibility into who we are building the features for and what business goals we are seeking to support. Ideas are well handled since contributors feel welcome to ask for features and the evaluation process provides transparency into the promotion (or not) from idea to feature. Product roadmaps provide information that executive management and board expect, in a usable format. The tool is incredibly powerful with many features that make easy to create a complex monster that consumes all your time, so you loose focus on the original goal - efficiently deliver a product that meets customer expectations and business goals. It requires discipline to keep the model simple. This is not a traditional project management tool. If you are responsible for creating products for a target market and are spending scarce cash on building the features needed to satisfy the market, this tool will help you make wise decisions and keep stake holders informed. All of the stakeholders in the company are aligned on product functionality and release cadence which minimizes surprises. We deliver better software because of feature prioritization. "Promising with a strong user experience"
The product looks promising. Most questions I've had so far were met with substantial answers and recommendations. It seems like "sky's the limit" applies with Aha! and their support team backing it up. UI can be busy, but this is always something that overwhelms people at first and once you get used to it things become familiar and you know where to look for the data you need. Also, I'm using the Jira integration and there's a big learning curve here to get things situated properly with a complex Jira setup (multiple projects with various workflows, etc.) However, Mike in support has been absolutely fantastic at answering all the questions I've had so far (and there have been a LOT). Every other product I've explored for certain purposes (some similar to Aha!) didn't have answers or recommendations for the things I was trying to accomplish. Aha! is the first tool that appears to do what I need, and even if what I need is complex they have a support team eager to help guide me through it. I might find some obstacles/blockers down the road as I'm new to Aha! however I feel confident their team wants to help empower me to be successful. Lastly, I first started the integration by mapping Jira Epics to Aha! Initiatives, which seems like the default out of the box recommendation. However I learned that mapping it to Master Features is the best way to approach it, and Master Features is not enabled by default. For learning purposes to get familiar with apps, I typically like to leave things configured by default until I encounter a need to modify settings. So, I had to redo my entire integration because it was configured by default which is not the recommended way of setting things up. This was the biggest pain for me so far. If you know this going in, then you're golden. Have an understanding of how you want your records structured in Aha!, and if you have an integration to set up ensure you map correctly. For example, mapping Jira Epics to Aha! Initiatives is very limiting (default), but mapping Jira Epics to Aha! Master Features is really awesome (must be manually enabled and is not default). Product Strategy platform to take things up a higher level than Jira. Jira is very tactical at a granular level of each ticket/record, and Aha! allows me to view/visualize things at different layers -- a layer cake approach. Furthermore, I've wanted to build an algorithm in Jira custom fields to consider lots of data points and automagically determine the value of prioritizing a ticket (impact vs cost). Aha! Score feature looks like a simple way to achieve this in Aha and I can perhaps link it to Jira ticket fields to get that knocked out. Another thing that's big for us is to be able to represent plans, strategy, progress, etc. at various levels to various stakeholders. For our products, and the entire portfolio of products. Standardizing on 1 tool to empower this, and getting everyone speaking the same language and looking at similar data structures/visualizations really helps streamline this. "Aha is the best way to manage your products. End of Story!" Aha gives us the easiest way to understand what features are in what release but most importantly help us objectively quantify which features are going to get the most bang for buck. I love the ideas section which has let us open up to our customers and get them involved in our product roadmap, and importantly keep them informed of how their contributions are making a difference. My favourite feature would have to be the configurable Aha Score. This has been the best way of solving arguments over which feature belongs in the next release. The integration with JIRA is great even if it does take a few goes to get it working exactly the way you want it too. It's a little daunting at first. This product just does so much!!! I do wish there were a really good simple dummy's guide to getting the most common things up and running including integration with JIRA. However, once I finally got my head around it, it has become second nature. Definitely attend one of the webinars to learn some of the features. Just start with one product and get everything working as you want it before adding in other products. Keeping track of the features and ideas for multiple products in our company. We are delivering better thought out software because of Aha that puts the most valuable ideas front and centre in our development roadmap. "Custom reports with time tracking"
It brings the point of view of the project applied to the final client at the same time that also shows the management that must be carried out of the team and the tasks that will be carried out to achieve the objectives. This double approach provides a much broader vision of the projects. The timeline report helps us to check and deepen all the characteristics of our product, the deadlines we have to design it and launch it to the market and also the objectives we intend to achieve once we have presented it in the market. These personalized reports convey a large amount of information for the creation of new products. You need to review introductions and videos to really understand the full operation of the platform since the learning can be somewhat long to have different features. The user interface could also be a bit better structured so that it would not be so difficult to understand at first, although when you have been using the program for a while and that difficulty is reduced. With Aha! You can structure and do a better follow-up of your projects and at the same time verify the final customer's vision of the product, so it is a good way to better manage the projects in the company. We can design and structure new products better before putting them on the market. It is more efficient to have an analysis of the timeline, characteristics and objectives that we want to achieve, since this helps us to have a greater long-term profitability. The operation of our company equipment has also improved, since Aha! facilitates cooperation and also to check the point of view of the end customer also helps us to better understand their needs and work to achieve them. Response from Claire George of Aha! Thank you so much for taking the time to share such a thorough review. I am delighted to hear that Aha! is helping your company better manage projects. Our goal is to provide a simple and consistent user experience throughout the application. We continuously improve our software and would love any suggestions you may have to make it even better. Please don't hesitate to share your ideas with us at https://big.ideas.aha.io. "Great product and awesome customer support"
The Aha! portal is a good tool for product managers. It has a lot of features, some very deep. It is possible to use it to manage everything or use only the most basic features. The 2 best parts are the constant evolution of the product and the customer service. There are update and new feature on (at least) a monthly basis and any email to customer support is answered in the same day, sometimes the same hour. I used JIRA for several years and I loved the keyboard shortcuts. Aha! does not have shortcuts, I would love to have shortcuts. We have a very creative and engaged workforce and customer base. They suggest ideas at a staggering pace. Aha! helps us stay on top of this deep idea pool. With its integration with VSTS, Aha! also helps us keep the developers in their tool suite and the rest of the company uses Aha! to stay informed of the status of the ideas submitted through Aha!. Thank you for taking the time to write such a positive review. I wanted to share this article that explains the shortcuts you can use in Aha! Let us know if this meets your needs. And if you have any questions, please do not hesitate to contact us at support@aha.io. With the use of Aha!, we have been able to become better organized and transparent with the projects in development with the rest of the company. We are able to easily integrate with Jira and Zendesk which also helps us stay in sync with multiple departments across the company as well. We implemented a user idea portal with Aha! and we've seen an increased growth in the communication of ideas from our users. It's wonderful to be able to promote an idea to a feature as we choose which ideas to incorporate, and then share that feature with Jira for our developers. At this time, we do not have any dislikes as the features we use in Aha! have met our needs. Try it! Aha! provides a 30 day, all access trial. It was through this trial that we were able to see what our team was missing and how Aha! could easily solve the problems and areas we needed to improve. Before using Aha!, we manually created roadmaps in a spreadsheet application and struggled to continue to keep these up-to-date and in sync with actual development work. Aha! has a great Reports section that allows us to display the features, epics, initiatives, and more, in a report and have it automatically update as the work progresses. These reports can then easily be shared with members of the company, which helps our department be more transparent in our efforts, goals, and timelines. Thank you for writing such a thoughtful and detailed review, Daisey. We are so thrilled to hear that Aha! is bringing better transparency and communication to your organization. "Clear focus on Product Strategy & Planning"
As an admin, I appreciate the ease & flexibility in customizing the UI + the incredible support & concierge team who is always available to provide guidance. My Product teams favorite part is the ability to have a top-down view of their work, either within the Initiative, the Release, or from the Hierarchy Report - for planning & management. There is some standard functionality our teams are used to utilizing in JIRA or other systems that aren't currently available in Aha!. However, Aha! leverages an Idea Portal and will consider customer-submitted Ideas for their Roadmap. It's also unfortunate that functionality like Custom Tables, is only available to E+ customers. Because Aha! is so feature-rich, it can have a bit of a learning-curve. Ensure you're confident in your PDLC and other processes before building out the tool and then give your teams the time to learn & adapt. Aha! also has one of the strongest support teams I've seen to help you along the way! We experienced a lot of gaps while solely using JIRA as our Product Management tool. Aha! provided an automatic Feedback Loop via the Idea Portal, a natural structure for Epics > Features > Stories (via custom naming), built-in Goal Structure, out-of-the-box integrations with our CRM & Development tools, one-click Roadmap Reporting, and - most importantly - dedicated focus on Strategy. Thank you for taking the time to write such a great review. We would love to hear about the additional functionality you would like to see in Aha! and glad you are already sharing your ideas via the portal. With regards to custom tables, we include it in the Enterprise+ plan because it is a sophisticated capability. This plan provides customers with a hands-on level of support. Please don't hesitate to contact our Customer Success team at support@aha.io if we can help in any way. "Fast adoption for clients and product owners"
Aha gives us one place to store our decisions related to a product as well as track UAT and Support needs throughout the product lifecycle - But more importantly, the filtering, reporting, and search functionality make it easier for our team to find the context and resources we need. By having the additional work we do in development sync up via Jira with aha, we are able to provide better reporting on scope changes. I've only just started applying goals and initiatives to product lines and products, but I am already seeing that it will be a valuable tool for our clients in prioritizing what is valuable to their organization. We are still in the initial stages of training our team, and so far the challenge has been assisting those users in seeing the right views, etc. It would be wonderful if we could assign default views to the team/individuals that they could then change if they wanted for their initial workspace. Some of our staff is less technically inclined than others, and navigation and filtering have been the biggest hiccups in training. Like with any product like aha or jira, you'll find more of your setup is about defining your business process and less about the software itself. Start small and work up to using more features in aha to avoid being locked at a standstill due to process changes. We use aha for a long term client, our internal custom software division clients, and our own product. Whenever I have presented aha to the stakeholders who would benefit the greatest, it has been our product owners and product managers, who have been the most excited. We've been looking for a way to bridge the gap between our technical and business teams, and aha has given us a place to do so while still catering to the many layers of stakeholders we have. The notebooks have been valuable for our custom service side when presenting scope to clients, as well as for C-Level reporting in the other business units. The idea portal has allowed us to create discovery groups that can input their ideas and suggestions, while still allowing us to decide final scope. It's been a wonderful way to increase collaboration and reduce miscommunication between stakeholder groups. It's increased the activity and engagement of stakeholders that were typically silent with our past discovery and product management strategies. Thank you so much for the excellent review. Please do not hesitate to let us know if we can help your team get familiar with Aha! Our daily live demos are a great way to discover what Aha! can do and answer any questions. This diagram shows how the Aha! data model works: https://support.aha.io/hc/en-us/articles/202001087. It might help the team understand the different record types and the relationships between them. I also wanted to mention that you can customize your menu navigation to simplify the screens you would like to be visible in your account. Again, if you need any help send us a note at support@aha.io. Our Customer Success team are all former product managers and would love to answer any questions. "Very feature rich for complex products"
The feature set of Aha is extremely comprehensive, and they constantly add new actually useful features. It does the majority of what I need, and the data models and hierarchy are extremely flexible, with custom fields and workflows enabling me to build out an entire product and portfolio management process. There are a variety of things that are very hard to do with Aha - they can be done but it takes a LOT of clicks. This discourages use of the product. A thorough UX review and redesign could probably drive up usage and utility quite a bit. Aha probably does what you need for product management. It is so feature rich that it can be somewhat challenging to use, particularly for new users or people outside the PM org not using it every day. But, it is incredibly flexible. I built an entire company collaborative culture around using it. There are some things it doesn't do, like integrate with CRM to get lists of customers etc. The Ideas Portal is great, very flexible way to gather input from other areas of the company, field reps, support agents etc. The Jira integration is very flexible and you can probably make what you need to work work, however the hierarchy is complex. Managing a complex platform product with many components. Portfolio management. Managing work for 7 engineering teams. Project management reporting cross-functionally. Answering questions of "when" and "what" for teams and other business functions. Thank you for taking the time to write such a great review. We appreciate your feedback regarding the overall UX. Our goal is to provide a simple and consistent user experience throughout the application. We continuously improve our software and welcome your suggestions to make it even better. If you have any specific thoughts on what we could do to improve the UX, please don't hesitate to add your ideas to our portal at https://big.ideas.aha.io. 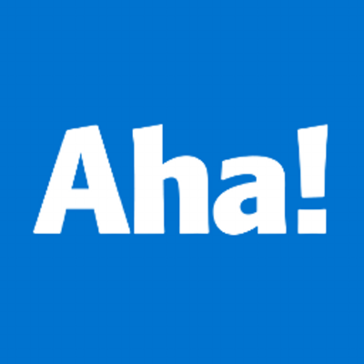 "Aha Fits the Bill for Product Management"
Aha has developed a suite of incredible tools that allow product managers and product owners to execute on strategy at every level. The broad overview is handled well by initiatives, goals, and releases. The day-to-day works great in tasks, features, and the like. Overall, there is a great balance of high level and low level prioritization of information. The only thing I dislike about Aha is the UI design. They really need to hire 1 or 2 UI focused designers who have done work on less technical apps so they can bring a fresh look. I know many of Aha’s customers are enterprise, but unfortunately the app looks enterprise in a bad way - ugly and a bit clunky. Take time to think through your implementation and talk with one of their experts to get a good grasp on how Aha can shape and organize your teams work and ideas. We are outlining our release schedule and cascading that information down to the feature and to-do level. We are also placing information about our company and products at a high level in the top bins where everyone in the company can see them. Thanks so much for your great review. We continuously improve our software and welcome your suggestions to make it even better. We encourage you to add your suggestions to our ideas portal at https://big.ideas.aha.io.
" Powerful product management tool"
Aha! This is a very full-featured road tool with a lot of multifunctional capabilities. Just to realize, what else needs to be done, and I can prioritize. In addition, I can see what my team members need to do, which simplifies the transition and support. In general, it is productive. This service does not need absolute functionality, but the numerous functions of Aha! must be easily accessible in mobile devices, including messages, ideas and functions. In some areas, I would like the document to be done in a different way, but this is insignificant. You can not doubt the productivity of this platform. So you will have an excellent strategy in the work. And also the opportunity to use a huge space for storing information. We apply Aha! with the goal of researching the product roadmap, presenting ideas, tracking ideas and creating custom events. In this regard, we have a much greater exponent, in connection with which the wishes will be prioritized in comparison with others. "Great tool, seamless integrations, and timely customer service"
Right now, our team is assessing Aha to use as a tool to help create a single source of truth for all work that is done by our Product team. We've traditionally used excel, powerpoint, a project management software, and a software dvelopment software; but we have found it difficult to manage work in many places and realized that none of these elevate the work we are doing to a leadership level for accurate read-outs. Aha, so far, seems to be the tool that will get us there! "A powerful tool that combines marketing strategy with delivery management and roadmapping"
This product covers so much ground that there is a significant learning curve and it can be a little hard to know where to start. The in app-training does a decent job of alleviating this, but at the end of the day, really versatile tools usually come with a learning curve, and AHA is no exception. Make sure you are clear what your most urgent organizational needs are: Do you most need to clarify strategy? do you mostly need a roadmap? Do you need to improve your progress management? This product can do a lot of things, so you need to know what you are looking for. AHA provides a single source of truth that connects our product strategy, market intelligence, and delivery roadmap together, so that we stay aligned as a product organization. "Stay focused on what's important for your working process." I guess the best at working days it is to have balanced scheduling which will make better discipline and with this platform, we have this chance. I'm glad that I found the faster and better management system. The software allows the bigger way for useful tools. By luck, I never have problems at work during use that platform. Doesn't bring any trouble and don't rush our team. Don't have any doubts about this platform as you will have the better strategy at work. You will have the ability to use the big storage place where you can store all your information it is very convenient for everyone. We receive the big help for inspection all our data and working plan. Wonderful to work with more concentration on working operation. The better way of working on our projects and create them in the very productive way. It is a wonderful strategy for execution working needs. "All information in one place makes your work easy." I'm glad that I found the faster and better controlling system of my scheduling. Now, I can have an effective process of working reports. Also, it is a wonderful way to work on projects. The software gives the big opportunity of useful tools. I'm glad that till now I don't have any bad issues with this software. Gives better and fast work for all of the team. If I have any question about working issue it is always easy to take a advice from help service. The software will give you the perfect strategy of all working routine. You can store all your information in one place which is useful and comfortable for everyone. Make your working steps more organized. Improve all your working skills. Very helpful platform for monitoring all our information and working steps.We have the ability to concentrate at working process mu better. We have the chance to create more effective projects. Actually, we have the powerful strategy for execution. This program is a miracle. It allowed us to organize everything in our system of product roadmaps, allows teams to quickly and visually track various projects on different platforms in the company. I want to note very competent support, which responded almost instantly after our appeals. There was a nuance of use with JIRA, but technical support was very quick and intelligibly told how to integrate correctly. Complex functionality at first glance, but quickly figured out. It took a long time to configure the application. The time spent paid off very quickly, which can not but rejoice. One of the best programs for marketing management. The program fully pays for the funds invested in it. Having seen it our partners also became interested in it and plan to take control. Very good product. It became much easier to manage all the requests of our customers. Optimization of the logistics of products has increased the productivity of our company. Huge saving of time, which helped to use more time for other tasks. Thank you for sharing such a great review. I am glad you were able to get everything configured the way you want. If you ever need any help at all, please do not hesitate to contact us at support@aha.io. Every member of our Customer Success team has deep product management expertise. We are available 24/7 and respond to everyone globally within a couple of hours. "Incredibly flexible and powerful solution"
The custom tables and unique layout options for each screen gives us the flexibility we need to show information for all teams. It's easy to customize and configure so we can figure out the best ways to store and show information with low effort. The customer success team surpassed my expectations and they are true collaborators - they've come up the ramp to understand our business needs and develop the most creative solutions within the Aha! tool. Dislike is perhaps strong but there's some functionality that would be very useful to see sooner rather than later. We've posted it to the ideas board and the dev team does an incredible job of rolling out new features and upgrades all the time. Get clear around what you're trying to do with the information you keep in the tool and focus only on the right structures for that information. It started as a way of gathering up all product information, moved into roadmapping, and is continuing into strategic planning. It's helping the team to stay focused on the near-term realities and stay away from the myriad of possibilities of what could be. The support from Aha! is simply outstanding. Fast response, good quality response and always a genuine willingness to help. The product takes a bit to get used to and there's a learning curve but there's a lot of support material in the form of videos and online documentation to help. It can feel intimidating at first but you do eventually get to an aha moment. Although sometimes seemingly overwhelming, my key to success is to not try to do it all and instead focus on a few features at a time and get to some level of comfort and mastery before introducing other features to the mix. Also depending on your PM maturity and any other tools in use you may for example start with Ideas and Features, then go back to Strategy. It's flexible enough to allow you to pick and choose. The suite of APIs I wish were more comprehensive and better documented. They scratch the surface and there are a lot of functions I wish I could fully automate but can't because the APIs aren't deep enough. For example, there's an API to create an integration but not to configure the integration which feels missing and broken. Better connection with our customers, more visibility and transparency into our prioritization process and roadmap. Accountability with Product Management has also increased because we now have a single tool to track and manage the end to end process from strategy to delivery which eliminated a lot of excel spreadsheets, powerpoint presentations and auxiliary tools. Thank you so much for taking the time to write such a great review. We also appreciate you sharing your feedback about the APIs. Please don't hesitate to send us a note at support@aha.io so we can better understand what you are trying to accomplish. Our Customer Success team are all former product managers and would love to help. "Great tool for Product Management"
Having one tool that is designed for product management (versus trying to take a tool geared for project management and making it work). Being able to integrate and tie together all parts of the product lifecycle from ideation to strategy to execution has been great. Seeing Aha release enhancements and continuously improve the product in a transparent way has also been very helpful. It's difficult to onboard new people, especially those that don't want to spend all of their time learning how to use Aha. We tried to use the reporting feature but it was too limited and constrained (e.g. stakeholder could not click through to see details of ideas, features, releases, etc.). We are now trying to train them to use the basics of the full interface. Also, even though there is a mobile app, it is very difficult to actually manage items through that interface. The mobile app and views are best for quickly looking up information but I have to do most of my work on my computer instead. Transparency of the product roadmap and providing clearer communication of what is being worked on and when new functionality and features will be available to customers and stakeholders. We're making progress in this area but it has been slower than planned due to the onboarding required (discussed above) to give senior stakeholders easy views into the roadmap and product direction while balancing their desire to be able to dive into the details periodically. "Great for Product Management in Distributed Teams!" The integration throughout the product. Ideas to Features to Reports. Its really easy to use. The Ideas portal is great for managing requests and giving visibility of those requests. The Gantt chart is great for roadmap planning and its easy to edit. The report Notebooks are super helpful, especially the live URL. Management can easily bookmark and view the current status. I like being able to use the "Parking Lot/Backlog" to manage features that we know we want to develop but are unsure of what release they should go into at the time. There's no integration with YouTrack, only JIRA. We would have to use an API in order to send the tasks to YouTrack. An interactive report would be helpful as the static images can cause issues when trying to share with management. The "View" options can be confusing as it takes you directly to the Reports tab, it's not a change in the view of that current you're on. It's great for remote teams as it allows easy sharing of information. Works best if you use JIRA for task management. Transparency of the product roadmap and what's being worked on when. Its helped reduce manual communication work with notifications. We've also used it to group our features into releases so we have a clearer plan of what the team is working towards. Creating the product strategy also helped us focus on the product plan. "Leading in the Roadmaping and product management tool space"
We are using it to plainly communicate what is going on with our products and teams. The "single source of truth" has been elusive for us. We are hoping Aha! can solve that for us. Thanks so much for your great review. If your organization ever needs help configuring your account and defining best practices, keep in mind that our Customer Success team are all former product and marketing managers. We would love to answer any questions you have — just send us a note at support@aha.io. "Aha! pulls together a product management toolkit"
Many tools offer visual roadmapping, but Aha helps a product management team rationalize the work behind the roadmap like none other that I've used. The strategic formulation, competitive analysis, and intake management tools help the team make sense of all the ideas coming in and plan for the greatest impact. The UI feels functional but a little dated. The pricing feels reasonable if you take advantage of all the features included, but Aha is likely overkill if you're just looking to visualize a roadmap and not develop one. The hierarchical approach to company>product line>product is helpful but it's easy to forget where you are until you get use to it. Take the time to research all the features included and think about how your team would apply them before making a purchase decision. Aha! has helped us manage idea intake more efficiently while not restricting people from submitting them. Our roadmaps are easily shared with interdependencies between projects mapped with communication channels established. Thank you for taking the time to write such a great review. We continuously improve our software and welcome your suggestions to make the software even better. We encourage you to add your suggestions to our ideas portal at https://big.ideas.aha.io. With Aha, we keep a large organization up-to-date with critical product information, including timing and status of deliverables. I love that Aha is so flexible and accommodating - we were able to implement our process and customizations easily and get up and running quickly. I do wish there were a few things to help enforce process: Mandatory fields, structured workflows. Other than that, there isn't much that I would change! We use Aha to track company goals and initiatives and align work contributed by multiple teams at that level. We then use that information to feed roadmaps that we can easily share with the entire company via Confluence pages. If need any help setting up your workflows, please don't hesitate to contact us at support@aha.io. Our Customer Success team are all former product managers and would love to answer any questions. If you have thoughts on how we could improve our workflow functionality, we would love you to submit an idea at https://big.ideas.aha.io/. Flexible, powerful and well thought out tools and reports, with integrations to most major engineering and project management systems. A single view of your enterprise at your fingertips. Complex setup and configuration makes it a challenge to get up and running quickly. No corporate training or follow-up education unless you're willing to subscribe at the high end of the package pricing. Be sure to have a well constructed view of your products and product lines before setting up the system. Highly recommend testing it with a single product/project at first to make sure your integrations are properly configured before rolling it out across the enterprise. High level view of your projects and company-wide initiatives with links to all of the other related resources and supporting material makes Aha a fantastic tool for companies of any size. It's especially useful if you have multiple products and/or multiple product lines. Huge benefits to seeing how your initiatives map to your overarching strategies and easily communicate that throughout your organization. We appreciate your positive review — thank you. If you ever need any follow up assistance, please do not hesitate to contact us at support@aha.io. Every member of our customer success team has deep product management expertise — and our primary purpose is to increase the happy use of Aha! We are available 24/7 and respond to everyone globally within a couple of hours. "Beautiful for Continuous Prioritization Planning and Publishing Roadmaps filtered for Mgmt/Customers"
When we need to add a new feature to a planned release, it's obvious to see how much work needs to be postponed, and which other features are lower priority. Also love the published reports! Aha is not integrated with VersionOne. The integration with Jira is spectacular! But for an organization using VersionOne, much of Aha's value can not be realized. Start high (Strategy). Focus on planning releases. If your organization is using Jira -- then use the Jira integration but empower Product Owners to be managing the details. The Product Manager will become ineffective if caught up in trying to manage the whole gamut. We have a large management group participating in the prioritization of our work. I can bring up Aha in the meeting and show everyone which features are stressing our releases, to inform and guide the hard decisions of postponing features. "Much better work for all your reports." Very good working tools. I like the easy way to use them. Helps me to manage all my scheduling. Very good and deep work on reports. Very good work on creating a project. Good work. Good that I have the ability to work easier. The very good product which helps you to work every day. I don't have any bad issue with it. Very good help from support service. Powerful software. It is will be good for everyone. At your work, you will have a really good strategy. That system will care about all organization at your working place. Very helpful support service. You will like it. Very good and more concentrate work on our project. We are excited about the product. Good job to manage data and all process. We like to work with good ability of wonderful tool. "The best piece of software a product-oriented team can own." The software was built for people iterating on the value inside of their product. The features are great, and simple to use, but more importantly I can see the decisions I have to make were a core part of the design of the application. The scorecard is a little rigid and doesn't accept copy / paste. Would prefer to be able to build my scorecard off of my feature custom fields instead of rebuilding my feature fields as metrics. Don't start in MS Office and migrate over. Start in Aha. They have everything you need to be successful. We're building an MVP product. AHA is allowing us to get through difficult decisions in no time and track those decisions for weeks out when we have no idea why we made that decision. The Aha! Customer Service team is amazing. I was in quite a bind and they were accommodating, understanding, and kind as we worked toward a solution. Nothing! I only wish that my company was able to roll this solution out enterprise-wide. The tool is what you make of it but if you ever have an issue, just know that the Customer Support is awesome! We needed an enterprise level roadmapping tool to help with visibility, accountability, and delivery. The visuals and level of detail provides flexibility for people to relay their information in the most effective way. Thank you for writing such a wonderful review, Carly! I like to have and to work that tools.I can easily to control time and scheduling. Also, reports on project details filed in Aha!. We are more concentrated on more important things. Really I don't know what to write here.I like to be with this product every day. Until this moment I don't have something really bad. If I have some issues I will contact support service. They work all the time. Now I can say that Software is an amazing and clear strategy. Will give you an ability to organize everything that you need. I like that support team is helping all the time.I recommend it. Great absorbing of the product control data and process. Completely full feature without becoming excess with other additional tools. Helps to us to views of the roadmap. "Aha! Is Magic for Product Management"
This is an amazing one stop shop for Product management. Aha! has so many capabilities. It's an EXTREMELY effective method in marrying our engineering team's work and the view they want to see with our business team. The integration with VSTS online makes our lives SO much easier. The only thing I dislike is parts of the interface. They need to make the UI a bit more intuitive. Make sure you try out their startup program if you meet the necessary requirements. You will save a bundle for the first year. We are outlining our release schedule for our two different product offerings and are distilling that high-level business view to features and user stories. Aha! Makes it easy for us. We are also putting in high-level information around competitors and ideas for future releases. Thank you so much for the great review Chloe. Wonderful to hear that the integration with VSTS is making such a difference to the way you connect with your engineering team. We would love to hear your suggestions to make the UI more intuitive. Please don't hesitate to add ideas to https://big.ideas.aha.io/. And of course, our customer success team is always available too at support@aha.io. "Aha a must-have tool for product creation"
The many templates for strategic planning and product roadmap implementations, forcing us to think business-critical issues, making even the average user as if we had an extra year of business school training on these issues. Definitely treasure the generous 1-month trial and have the whole team try it out. Mainly business planning and product design: using Aha helps everyone communicate vision and planning clearly, especially to outside parties who may not speak the same business/design/technical jargons that we do. Thank you so much for your positive review. We are glad you are finding the strategic planning and roadmap templates so helpful. We include templates in other areas of the application too — including more than 80 reporting templates. We would love to hear what other types of templates you would find useful. Let us know! "Aha a must to have tool for Product Managers." Aha! is one of the best tools for Product Manager to manage end to end the requirements aligned with product strategy and business goals. It also provides seamless integration with various project management & collaboration tools like Salesforce, Jira, Slack & others. Nothing specific which I can mention but I would suggest for an enhancement to have some option track activity on milestone/release with dependency. I highly recommend using Aha! for Product Management as they have all the required feature and also filling the gaps as the industry & technology is advancing. We are using Aha! for our product requirements and Product Roadmap with Release tracking. And also as a collaboration tool for our Sales Leader/Customer/Product Management to gather requirements & Feature Ideas and build product roadmap. Thank you for sharing such a positive review. I wanted to share some functionality in Aha! that you might find helpful for managing dependencies. We would be more than happy to answer any specific questions you may have about this. Please contact us at support@aha.io and our Customer Success team will respond within two hours. "One central point of telling a story about your product"
Simply everything what product needs in one central place from vision, goals, personas, initiatives, ideas, features is really useful to have. Starter roadmap feature is fantastic idea! There are few bits and pieces when it comes to functionality but you can adapt quickly. Biggest thing but depends on company needs is that you might be missing some of project management functionalities like capacity planning, forecasting but that depends on what problem you want to solve. One central place for multi product management, features dependencies. Brought bigger transparency and efficiency at work. "A Product to Learn From "
Not only has Aha helped us stay on top of our product management process, but it has also helped us learn how to be a better product team. The features within, their approach to support, and even their philosophy as described in their CEO's book have all advanced our thinking. A very short list. Some times it can feel like there are too many options to pick from, and their reporting module is a little hard to understand, but these are minor elements. Mainly, it's been a way for us to develop and communicate our product prioritization process. It's is the source of record for what we are thinking about as a product team, and what we are planning to work on in the future. Thank you for writing such a great review Brian. It is wonderful to hear that Aha! is having such a positive impact. If you ever need any help setting up reports, please don't hesitate to send us a note @support@aha.io. Our Customer Success team are all former product managers and would love to answer any questions. "From Strategy to Project Management and Feature Implementation, Aha is the way to go. " Aha allows product managers to stay on top of initiatives in an organized, sensible fashion. It aligns an entire organization through conscious goal setting while managing time appropriately. The Jira integration is very beneficial to us, as our tech team primarily works there. I have not yet figured out how to assign users to release phases. We are improving internal communication and being mindful about why we are improving product features, and to whom iterations are most benefiting. It is also a wonderful project management software. Release phases are intended to help you group tasks and deliverables so you can manage the success of your release. You can add to-dos to release phases and assign them to users. You can also assign the features within each phase to users. This helps you manage the various cross-functional tasks that need to be completed within each phase. And of course, if you ever need help, please don't hesitate to send us a note at support@aha.io. Our Customer Success team are all former product managers and would love to answer any questions. "One of the most fully featured roadmapping tools on the market"
Aha! is a very fully featured roadmapping tool with tons of functionality. We liked the Salesforce integration the most, which allows our salespeople to enter Aha! feature requests via Salesforce opportunities. This enabled us to rank feature requests by associated revenue so we could track business relevance. Another outstanding aspect of Aha! is its customer support. All of its customer success folks are former product managers and they provide excellent support. They are quick to respond and they are very informed. 1) We sorted our feature requests on a milestone granularity. Our prioritization process required us to stack rank milestones so we could move them around as needed. Aha! has no ability to track the stack rank so we wound up doing it in Excel, which defeats the purpose of using Aha! to track prioritization in the first place. 2. Therefore, our primary use of using Aha! was tracking feature requests via Salesforce. The main drawback here was that while Aha! enabled us to sort feature requests by associated revenue, we needed more business context. In other words, we wanted to know whether a customer requesting a feature considered it a "must-have" or a "nice-to-have". Aha! therefore needed more fields for the mapping between a customer and a feature request. If you're planning to integrate with Jira, make sure you figure out the mapping between Jira objects and Aha! objects before moving forward. Had we known before purchase that Jira integration wouldn't have been possible, this may have affected our decision. The biggest problem we are solving is to track feature requests and rank them by associated revenue. We therefore have much greater visibility into which requests should be prioritized over others. The ability to quickly create roadmaps, epics in the roadmaps with links to relevant Jira tickets and ability to publish links for direct reporting on roadmap changes. I'd like the ability to create a report on multiple roadmaps across different programmes of work rather than a single roadmap/project at a time. Explore all its feature sets not just the Feature boards! An efficient and coherent tool for managing multiple roadmaps that is shareable with multiple stakeholders providing visibility and u to date reporting. Thanks for sharing how you are using Aha! to quickly build roadmaps. You mention needing to report on multiple roadmaps across different programs. If you need any help, please don't hesitate to send us a note at support@aha.io. Our Customer Success team are all former product managers and would love to answer any questions. "Brought our roadmaps into the 21st century! " Aha! brought our organization's product management function into the 21st century. We have used it for 12 months and I barely remember the days of PowerPoints and spreadsheets and legal pad scribbles. Now we are on a SaaS solution that integrates with the company's SSO. I love the accessibility and usability of Aha! The support team is top-notch, highly responsive to my questions. Aha's crowd sourced "big ideas" site shows their own product in action, and enhancements are regularly delivered to the solution. Reports is highly customizable and can really Tell The Story of your releases, but it requires a working knowledge of pivot table formatting and has not been highly adopted across the team. Also, the report templates provided are heavily focused on tying back to strategy. For products where work is happening but strategy is not fully defined, those templates are not very worthwhile. Organizational transparency to product intake and product roadmaps, a common language for feature development status, and a one-stop-shop for keeping track of the million details that go into release planning. You can also find more than 80 templates in your reports dashboard. These templates let you quickly report on goals, initiatives, releases, features, requirements, and to-dos. We would love to help you create the reports you need. Our Customer Success team are all former product managers and would love to answer any questions you may have. Send us a note at support@aha.io any time! Aha does a lot. I think its integration with Jira is probably one of the strongest things and makes product management a lot easier by not having to worry about duplicate entry of user stories or initiatives. Aha has a bit of a learning curve. I had downloaded the free trial but didn't really understand what all it could do until I used it at a company who had already implemented it. It was definitely overwhelming at first! Give it time. It certainly takes a bit to get everything set up with integrations and workflows so that you can use it exactly how you want to. It's kind of like Jira in that it can do so much that the only downside to that is the time investment required to configure it. We use Aha for product roadmapping, idea submission, idea tracking, and user story creation. It really helps us from start to finish when deciding what the product and engineering team is going to build. "Expanding Enterprise Uses for Aha!" I love the adaptable data and workflow models in Aha! By just modifying entity terminology, workflows, and attributes, I can represent and manage any domain process I want. I don't dislike any of the basic concepts in Aha!, and my dislikes are centered around improving the Reports experience to make is easier to find specific reports from the reports landing page. Aha! is more structured, but more adaptable than many competitors. That, plus the awesome integration features make this tool a great investment. Using Aha! as Product and Project reporting tool is a win for my clients! We are using Aha! to manage the gap between customer service and product development. Before implementing a custom solution in Aha!, updates to customers were managed in a spreadsheet. This led to lots of "busy work" on the part of customer service and development just to update the status of an item that was being delivered as a fix to an issue. Now, the updates are automatic, based on Feature delivery life cycle. The background noise has almost disappeared, and the customers have accurate, up to date information automatically. "This product will become by right arm"
The level of detail of functionality surprised me, Aha! really has thought of everything and I feel it showcases my strategy and outputs in a great light. Their customer service is some of the best I've ever experienced. As someone relatively new to PM Software I was a bit daunted by other reviews and the potential level of difficulty to use, however I found it quite the opposite - I will start with the essentials and continue to build out as our product matures and so far have found the tutorials more the sufficient. There are so many layers but as I was told it's totally up to you to which level of complexity you use it and I can see that. To be honest as a new user not much yet! As I build out the prioritised features and work through the capacity planning tool with our Dev team it's been all positive. I get the impression straight up that Aha! welcomes feedback and prides themself of continuous learning of it's users (based on emails and contact had) which makes me feel comfortable that any challenging pieces I face I can capitalise on their expertise. Many of the reviews say it's a very complete product - though as a new user, while I'm not experienced with many other PM softwares I found it quite self explanatory with the help of the tutorials. We needed a more streamlined way to plan releases and prioritise functionality, pulling into a visual roadmap. The ideas portal is also invaluable for us. "Organize and Prioritize Upcoming Releases"
I like the visual layout, being able to see what my upcoming releases look like and prioritize things by dragging them around. There are a lot of little usability issues, for example, you cannot multi-select and perform bulk actions on features within a release. Doesn't seem like a big deal, but when you have to manually alter each feature in a release with a ton of featrue cards it's a drag. There are many other small nuisances like that I come across daily, but that's the one that's on the top of my mind. It's the best Product Management software out there, but the space still hasn't found it's Salesforce. Aha could be to PM what salesforce is to CRM, but it's a long way off, currently. Organizing, prioritizing, and keeping track of releases in progress and then reporting on finished releases. If you think of other usability enhancements you would like to see, please submit an idea at https://big.ideas.aha.io — we love hearing how we can make our software even better. "Just Barely Scratched the Surface"
The Aha! task requirements are a godsend, because they mimic the way I make lists: they allow for cross-offs/check completed. The tagging feature is great, as well. I feel like I've barely scratched surface at what Aha! can do and the way Aha! labels its tabs are a bit confusing. I do wish that was more intuitive; I'm having to bookmark specific pages because I can't remember how to get from place to place. I also don't like that there are different tiers of access, so that I have to sign in and out to be able to assign team members tasks, etc. There have been a few miscommunications and tasks or follow-ups that have fallen through, simply because it's difficult to keep track of tasks that aren't directly tagged to you. Use it. It won't hurt. It's useful and although a bit clunky, it's not completely difficult to grasp. Give yourself between 2 to 4 weeks to get used to the product and get some training to get the most out of Aha! There are places you can make and collect notes, there are different filters to explore, etc. Task management and project management. The benefits are that everyone in the company - not just on my team, but everyone in the company - can track the progress of a task. The tagging feature, which I mentioned above, is neat, even though it only allows me to tag the people who are part of the content channel, as opposed to the separate development channel. The search function is comprehensive, though, so that's helpful. If you need any further help, please don't hesitate to send us a note at support@aha.io. Our Customer Success team are all former product managers and would love to answer any questions. Aha! is a single project management tool that adds higher benefit when managing multiple projects in an environment that may be stretched for resources at any given time. The best part, this is system of managing a project portfolio . - It can keep the track of master features that can be linked to multiple features which can be further linked to multiple requirements. -Images don't always align well with our corporate ppt. -Need to be more accessible on mobile devices. -Data backups are only available at the Enterprise Plus license tier. The project we are currently working on uses AHA to gather all the features and the requirements, It is also a useful tool to manage our product releases. Thanks for your review. I am happy to hear that Aha! is helping you effectively manage your project portfolio. "Great tool, lots of integrations with other products, very intuitive and very fast personal support"
I like how this tool is a great PM tool for visualizing the roadmap, understanding all the pieces that go into achieving the roadmap goals, how ideas/features/releases/initiatives/goals are all tied together. The Aha! Score is extremely valuable and helps teams plan upcoming releases easily. No more meetings with opinions driving the results! There's not a native mobile experience yet. It doesn't need full functionality but many features of Aha! should be available on mobile including reports, ideas, features and releases. I also don't like that To Dos are not a part of a template. This would reduce a PM's workload and help companies use Aha! to standardize their processes immensely. The Aha! score needs to be tied into the 2x2 matrix for Initiatives and Goals along with the user being able to customize how the scores are reflected in the matrix. This tool is only as good as the user using it and they training to understand the Aha! methodology. It's a strong one that I support and see how it can work for many different organizations. It's very important to get this tool for non Product stakeholders to use as it's meant to create a cohesive cross functional operation between Product and everyone else. I'm working with my client to integrate Aha! with JIRA, standardize their Product departments processes while using Aha! to remove roadmapping Excel files and reduce/end some cross functional meetings. It appears this will work easily as the PM's have easily bought into Aha! and leadership see the value clear as day. * We monitor all Aha! reviews to prevent fraudulent reviews and keep review quality high. We do not post reviews by company employees or direct competitors. Validated reviews require the user to submit a screenshot of the product containing their user ID, in order to verify a user is an actual user of the product. Hi there! Are you looking to implement a solution like Aha! ?